Engine anti-ice captions are: COWL VALVE OPEN, R VALVE OPEN, L VALVE OPEN. TAT TEST button (ie aspirated probe). NB if there is no TAT TEST button you have an unaspirated probe. If window heat is switched ON but the ON light is extinguished, this means that heat is not being applied to the associated window. This could be because the heat controller has detected that the window is becoming overheated (normal on hot days in direct sunlight) and can be verified by touching the window. The heat will automatically be restored when the window has cooled down. To verify that window heat is still available a PWR TEST should illuminate all ON lights if the window heat switches are ON. The PWR TEST forces the temperature controller to full power but overheat protection is still available. If an OVERHEAT light illuminates, either a window has overheated or electrical power to the window has been interrupted. The affected window heat must be switched OFF and allowed 2-5mins to cool before switching ON again. The OVHT TEST simulates an overheat condition. 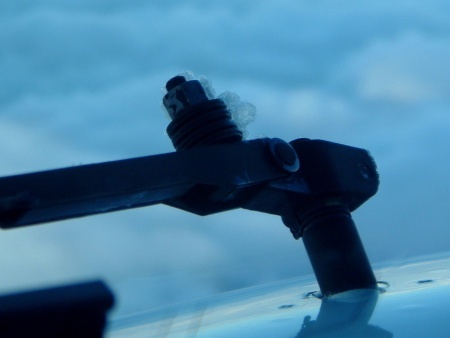 Wing anti-ice (WAI) is very effective and is normally used as a de-icing system in-flight, in applications of 1 minute. On the ground it should be used continuously in icing conditions. The WAI switch logic is interesting, on the ground, bleed air for WAI will cut-off if either thrust lever is above the take-off warning setting, but will be restored after the thrust is reduced. 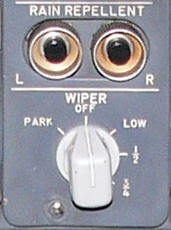 This allows you to perform engine run-ups etc without having to check that the WAI is still on afterwards. The switch is solenoid held and will trip off at lift-off, this is for performance considerations as the bleed air penalty is considerable. 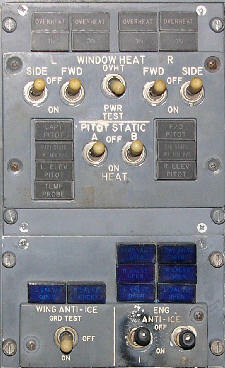 Note that on early systems, ie those with a GND TEST position, with the WAI switch ON on the ground, the WAI is inhibited until lift-off ie "armed", This is opposite to the present system. WAI, unlike engine AI, uses bleed air from the main pneumatic manifold, this is to ensure a source of bleed air during engine out operations. Only the leading edge slats have WAI (ie not leading edge flaps). The NG series outboard slat has no wing anti-ice facility (see photo) believed to be due to excessive bleed requirements. However in June 2005 it was announced that the 737-MMA will have raked wingtips with anti-ice along the full span. This is because the MMA will be spending long periods of time on patrol at low level where it will be exposed to icing conditions. NB Where QRH ENGINE FAILURE/SHUTDOWN drills ask “If wing anti-ice is required:”, if icing conditions are anticipated, these actions should be completed in preparation for WAI use to prevent asymmetric application. There is no bleed penalty for this reconfiguration until WAI is actually used. On the NG, if WAI is used for more than 5 secs in-flight, the SMYD will adjust the stick shaker speeds and manouvre speed bars to allow for airframe ice. Engine anti-ice (EAI) heats the engine cowl to prevent ice build-up, which could break off and enter the engine. The 3/4/500 spinner was originally conical to prevent ice buildup but was changed to an elliptical shape to deflect ice away from the engine core. The NG's have the best of both worlds with a coneliptical shaped spinner (see photo left) that does both jobs. EAI should be used continuously on the ground and in the air in icing conditions. It uses 5th stage bleed air, augmented by 9th stage as required, from the associated engine. COWL ANTI-ICE lights will illuminate if an overtemp of >440C (not NGs) or overpressure >65psig condition exists in either duct. 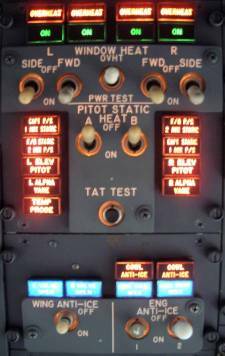 In this situation thrust on the associated engine should be reduced until the light extinguishes. 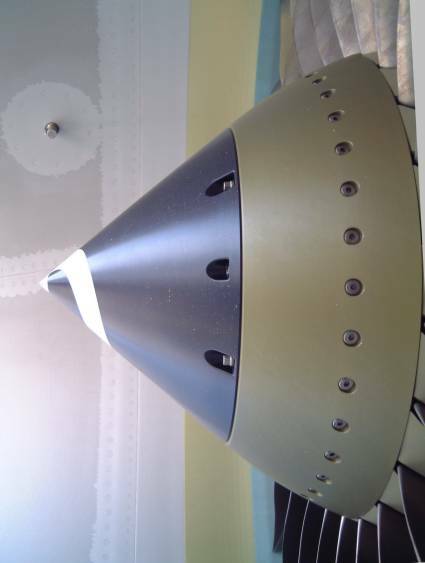 Wing and engine VALVE OPEN lights use the bright blue/dim blue - valve position in disagreement / agreement logic. The wing L and R VALVE OPEN lights in particular may remain bright blue after start and during taxy. This is because they are pneumatically operated, they can be made to open with a modest amount of engine thrust. 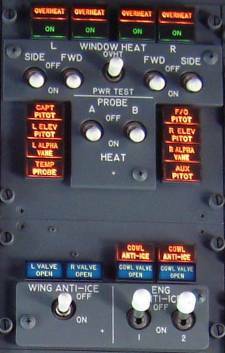 An ice detection system is an option that is rarely taken up on the 737 so it is up to the crew to spot ice formation and take the necessary action. 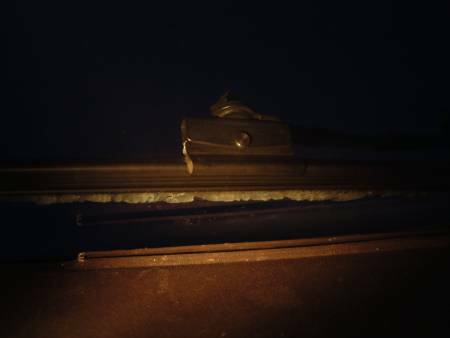 The following photos show some of the places where ice accretion is visible from the flight deck. Note engine anti-ice should be used whenever the temperature and visible moisture criteria are met and not left until ice is seen, to avoid inlet ice build up which may shed into the engine. Under the windscreen wiper blades. This is one of the first places that ice will form, precipitation falls on the bottom of the windscreen and runs up to the wipers. 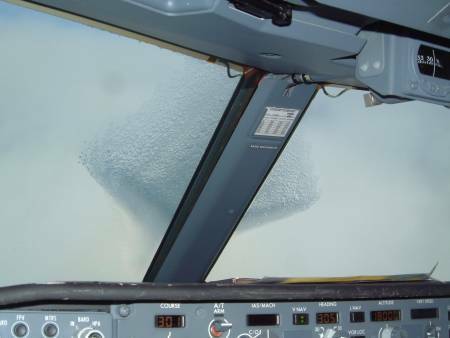 This is not an accurate indication of the amount of icing on the airframe because of the stagnation point where the blade and windscreen meet and also because the windscreen is heated. I would describe conditions where ice forms here as LIGHT ICING. This is my preferred indication of airframe ice accretion. If ice is seen here it is surely also on other parts of the airframe. The weight and aerodynamic effect of all this ice on the the airframe and control surfaces is why there is the "residual ice" penalty of several tons on the landing performance graphs "If operating in icing conditions during any part of the flight when the forecast landing temperature is below 8C, reduce the normal climb limited landing weight by xxxxkg." (FPPM 1.3.3). I would describe conditions where ice forms here as MODERATE ICING. For ice to form on a flat heated windscreen, conditions must be bad. You can see how the shape of the formation follows the airflow lines. You can imagine how much ice is on the rest of the aircraft, especially when you consider that most of it is unheated, particularly on the fin and stabiliser. Vol 1 SP.16.8 states "Avoid prolonged operation in moderate to severe icing conditions." This photo was taken at about 20,000ft climbing through the tops of rain bearing frontal cloud. The ice shown here formed in under a minute. I would describe conditions where ice forms here as SEVERE ICING. The NG's have a problem with frost forming after landing on the wing above the tanks where fuel has been cold soaked. This is officially known as "Wing upper surface non-environmental icing". 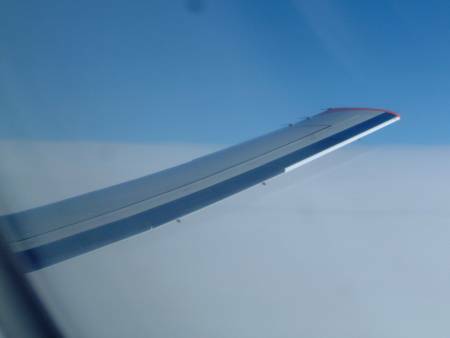 The reason is the increased surface area of the fuel that comes into contact with the upper surface of the wing. This is because the shape of the wing fuel tanks was changed (moved outboard) to accommodate the longer landing gear that was in turn required for the increased fuselage lengths of the NG family to reduce the risk of tailstrikes! The only solution until recently has been to limit your arrival fuel to less than approx 4,000kg. Now Boeing have issued guidelines on the acceptable location and amount of upper wing frost. The Boeing advice is as follows: "Flight crews should visually inspect the lower wing surface. If there is frost or ice on the lower surface, outboard of measuring stick 4, there may also be frost or ice on the upper surface. The distance the frost extends outboard of measuring stick 4 can be used as an indication of the extent of frost on the upper surface. It should be noted that if the thickness of the frost on the lower surface of the wing is 1/16 inch (1.5 mm) thick or less, the thickness of the frost on the upper surface will be less than 1/16 inch (1.5 mm) thick. If the thickness of the frost on the lower surface is greater than 1/16 inch (1.5 mm), then a physical inspection of the upper surface frost is required." 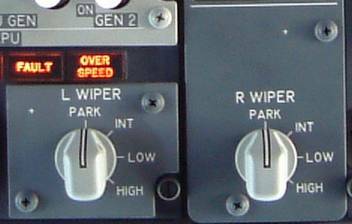 One of the most welcome features of the 737-NG is the improvement to the windscreen wipers. The wipers are now independent, have an intermittent position and best of all - are almost silent. The rain repellent has been removed due to worries about the environmental effects of the "RainBoe" fluid used as it contains CFC's. It is also poisonous and in 1991 Boeing added D-limonine which has a strong smell of orange peel into RainBoe so that leakage could be detected. There are no plans to replace the rain repellent with another liquid product even though there are safe alternatives eg "Le Bozec". On 25 May 1982, a 737-200Adv (PP-SMY) was written off by a heavy landing in a rainstorm. 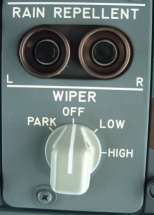 One report stated that "The pilots misuse of rain repellent caused an optical illusion". Since early 1994 all Boeing aircraft have been built with Surface Seal coated glass from PPG Industries which has a hydrophobic coating. The coating does deteriorate with time depending upon wiper use and windscreen cleaning methods etc, but can be re-applied. Check out this video of a 737-900 DV window opening during the take-off roll during flight testing. Notice that a high speed abort is not necessary if the DV window opens. Engine anti-ice must be on when icing conditions exist or are anticipated, except during climb and cruise below -40°C SAT.